**Stay at each station for 4 minutes/8 rounds before rotating to next station. 555 Fitness Firefighter Hero WOD: This workout is dedicated to Karl Joseph, FDNY, Engine 207, who was killed on September 11, 2001. 2 min Every 30 sec. Each exercise is scored by the weakest number of reps (calories on the rower) in each of the eight intervals. The score is the total of the weakest scores from the five stations. Stephen Wenger is August’s Athlete of the Month. Read more about the Burlington Native who is always the first to show up to every 5:30AM class at 5AM. He takes the time before the others arrive to do his morning ritual of stretches that will get him primed and ready for the workout of the day (WOD). 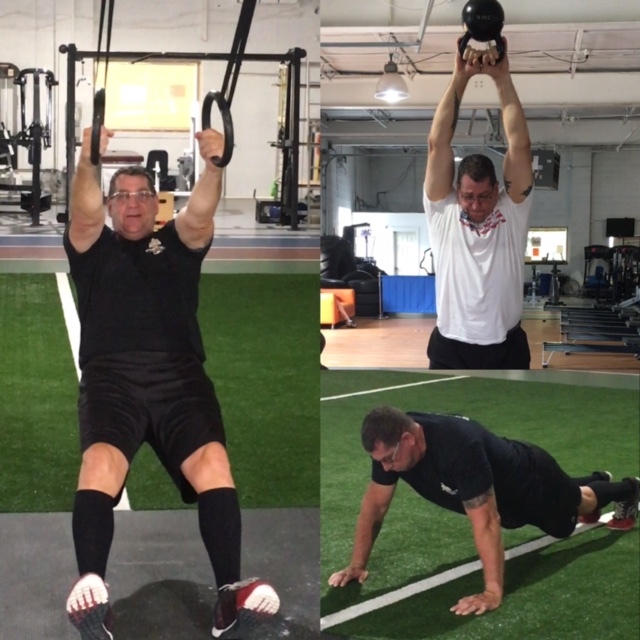 Read more about Stephen below who shares that anyone can do CrossFit even if you have certain limitations and restrictions. Modification of movements can always help you through any and every WOD. How did you learn about CrossFit and how did you end up in our awesome Box? I had read about Crossfit online and began doing some workouts from the Crossfit site at the gym. I did the Elements classes from a Groupon ad at the Willingboro location, but at the time I couldn’t get the class times to work. After retiring from the police department I had a more flexible schedule and joined the Burlington location. What do you like most about being a FIT member (Hyper CrossFit Athlete)? I enjoy the people. Everyone is so friendly. You get to know everyone and get concerned when they aren’t there. It was nice doing a competition and have some of the members show up to cheer you on. What is your proudest moment/biggest accomplishment since you started? Handstand push ups. It took me a long time to be able to get upside down. What are you still working on to achieve? Muscle ups. Just one please. Tell us one random fact about yourself that has nothing to do with CrossFit. I play bagpipes with the Camden County Emerald Society Pipes and Drums. Our mission is to honor those that have made the ultimate sacrifice. What is your favorite WOD or benchmark? I like the Isabel or Grace, because they are just lifting. I have to be careful. Because of my knees, many movements are painful. If you created a WOD and named it after yourself, what would it be? Call it “I Plead Not Guilty.” I like AMRAPS. Something with a row buy in and then deadlifts, box jumps and kettlebell swings. What advice would you offer to someone interested, but intimidated to try CrossFit? When I talk to people about Crossfit they say they can’t because of certain physical limitations. I tell them that there is always a way to modify the exercise to accommodate the limitation. Jump right in, the water’s fine.